The library will be closed on Thursday, November 24. Regular hours will resume on Friday, 9 AM~5 PM. Get into the holiday spirit and help ensure that every child in our community has an enjoyable Christmas with a gift from Santa under the tree. The Hill Daisy/Brownie Troops and the Hill Fire Dept. are collecting donations of new, unwrapped gifts and gift cards for children of all ages. Besides toys, there is also a need for gifts suitable for teens (toiletries, gift cards, games). Drop-boxes are located at the Town Office Building and J.D. Blake School. All donations will be wrapped and distributed to families living in Hill. For more information, please call Leda Guillotte at 744-2008. Thank you in advance for your support! Is there a special someone with a sweet tooth on your gift list this year? Are you looking for something scrumptious (yet hassle free!) to serve at your holiday gathering? Let The Friends of Hill Public Library help you with your holiday shopping! 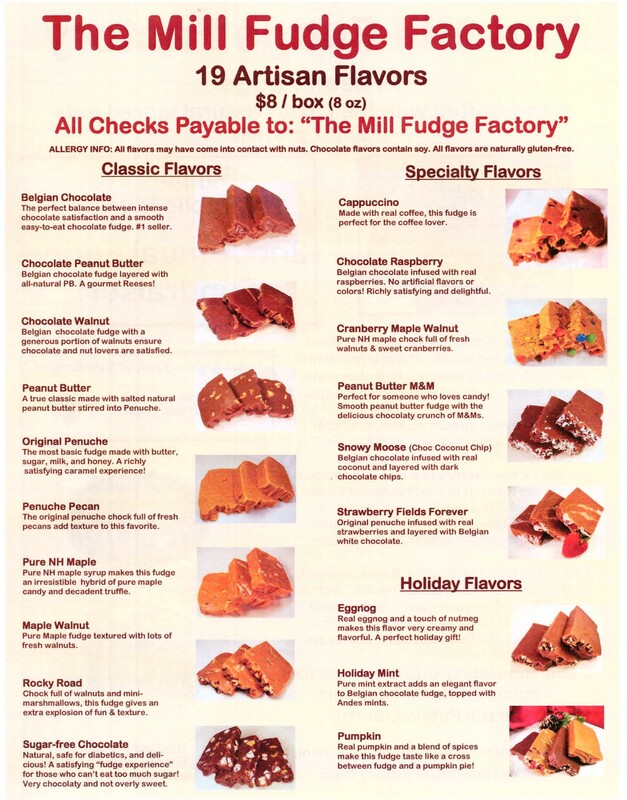 Once again we have teamed up with The Mill Fudge Factory of Bristol, and are now taking orders for their premium fudge, available in nineteen mouth-watering flavors! YUMMY!! The cost is $8 a box and all proceeds benefit The Friends of Hill Public Library. Orders must be placed by November 29. The fudge will be available for pickup during the week of December 19. Please stop in or call the library at 934-9712 and place your order today. Thank you!